There has been so much deception in the churches when it comes to Holidays and dates. Most of the holidays celebrated are actually because of Roman gods, not because of the Father and Son, the Messiah. 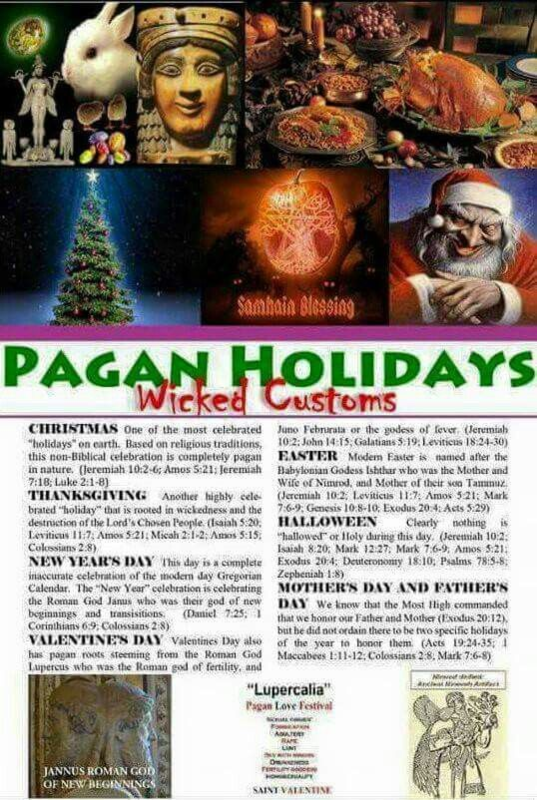 The proper Holidays are listed below with an actual Biblical calendar of dates. The Calendar of Enoch 364 days is the most correct Biblically for following Holy Days. Enoch 72:32. On that day the night decreases and amounts to nine parts, and the day to nine parts, and the night 33 is equal to the day and the year is exactly as to its days three hundred and sixty-four. Enoch 72:33. And the length of the day and of the night, and the shortness of the day and of the night arise-through the course of the sun these distinctions are made (lit. ‘ they are separated ‘). Jubilees 6:32	And command thou the children of Israel that they observe the years according to this reckoning- three hundred and sixty-four days, and (these) will constitute a complete year, and they will not disturb its time from its days and from its feasts; for everything will fall out in them according to their testimony, and they will not leave out any day nor disturb any feasts. Jubilees 6:33	But if they do neglect and do not observe them according to His commandment, then they will disturb all their seasons and the years will be dislodged from this (order), [and they will disturb the seasons and the years will be dislodged] and they will neglect their ordinances. 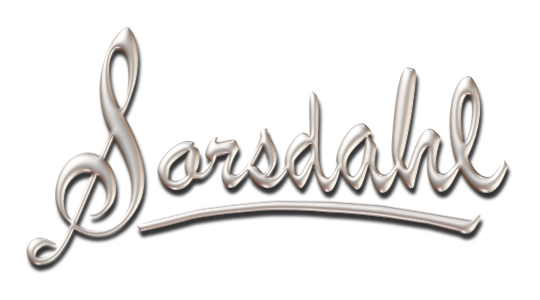 2nd Esdras 14:1 And it came to pass upon the third day, I sat under an oak, and, behold, there came a voice out of a bush over against me, and said, Esdras, Esdras. 2 And I said, Here am I, Lord And I stood up upon my feet. 3 Then said he unto me, In the bush I did manifestly reveal myself unto Moses, and talked with him, when my people served in Egypt: 4 And I sent him and led my people out of Egypt, and brought him up to the mount of where I held him by me a long season, 5 And told him many wondrous things, and shewed him the secrets of the times, and the end; and commanded him, saying, 6 These words shalt thou declare, and these shalt thou hide. The displaced Zadokian Priests, the Enochian Communities of the Qumran caves and the Dead Sea Scrolls (DSS) discovered in 1947 followed an established Solar Calendar without any regard for the phases of the moon. They rejected the Babylonian-Grecian Lunar Calendar (now in use in Rabbinical Judaism) that was imposed when the Greeks invaded the Land of Yisraél. 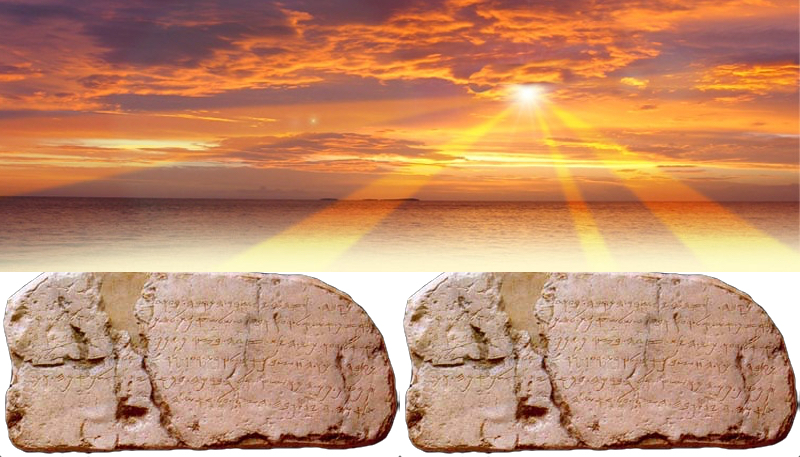 With the recent discoveries of the Dead Sea Scrolls (DSS), there are attempts to return (testing) to the Solar Calendar described in the Books of Ḥanoḳ (Enoch) and Jubilees. The year starts in the Springtime, marked from the Vernal Equinox, and is based upon a year of 12 months, 30-days each, for a total of 360 days, along with 4-Intercalated days (one in each quarter as a seasonal transition day). This equals a total of 364 days. 364 divides perfectly into 52 Sabbaths and the Festival Days are on the same days of the week every year (unlike the Lunar Calendar). 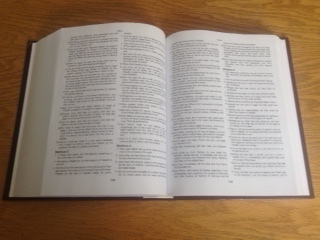 One finds the starting point and then inserts the special days as enumerated by the Torah of Moshe (Exodus 12; Leviticus 23). The traditional Gregorian Calendar we use in the Bible is a pagan term. 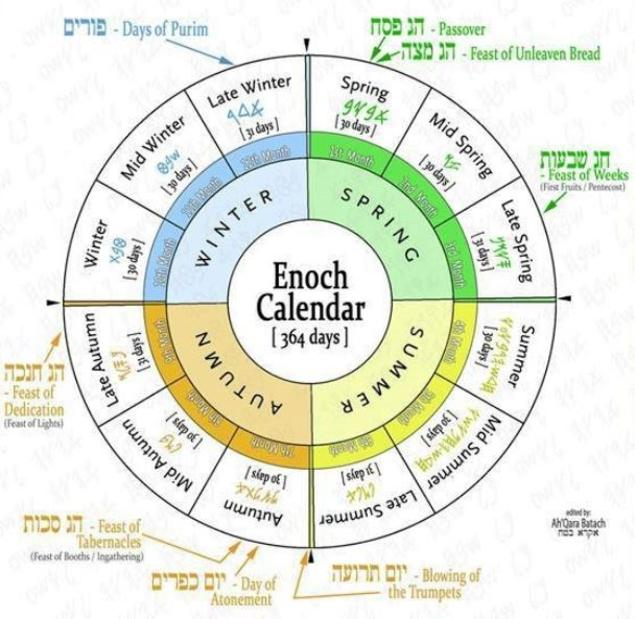 The Enoch Calendar is shown in the 1st Book Of Enoch and was given by the Angel Uriel (YahEl), and is the original Priestly Calendar that was used in the Torah. The Enoch Calendar is a 12-Month Solar Calendar having 364 Days Only, and it was used by the antediluvian patriarchs and by Noah, Abraham, and Jacob. It was taught to Moses by the Angel Yah and it continued in effect through the 2nd Temple period under Ezra and Nehemiah. It was the official Hebrew calendar until the 2nd Century BCE, when King Antiochus IV Epiphanes ended the use of the Enoch Calendar and forced the Hebrew people (sons of Eber/Heber) to observe the Lunar Calendar. 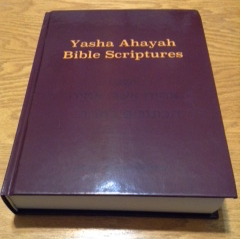 This is handy for knowing when to celebrate Sukkot, The Feast of Tabernacles, the birthday of the Messiah YASHA. There was no letter J 500 years ago, so His name cannot be Jesus!